And when I say “Gilded Age New Orleans”, I’m guessing that you’ll ask “What’s the Gilded Age”? And that’s a very fair question. The short answer is: in American studies, the Gilded Age is the time period from 1877 to 1900, which is about the same time period as Britain’s late Victorian era. I didn’t know about America’s Gilded Age until I studied history at Florida State University (FSU) in Tallahassee. FSU was also where I learned about women’s history. I was awestruck by the stories of late 19th century American women who lived life on their own independent terms while at the same time helping to improve the lives of other people. My new heroines were women like settlement house founders Jane Addams and Ellen Starr Gates, social reformer Florence Kelley, and women’s suffrage advocate Alice Stone Blackwell. And of course, I adored the female adventurers like “around-the-world-in-72-days” journalist Nellie Bly and presidential candidate Victoria Woodhull! 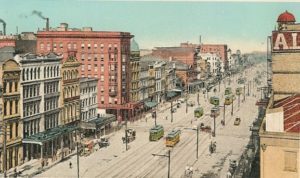 By the time I started working on my graduate history degree, I also adored the city of New Orleans (only six hours from Tallahassee). I was totally seduced by the romantically shabby French Quarter, the magnificent mansions of Audubon Place, the non-stop tropical greenery, and the overwhelming feeling that this old, old city was expecting me to love it. And reader, I did. Not surprisingly, my fascination for Gilded Age heroines and the city of New Orleans intersected! I was inspired to write my master’s thesis about the women (and men) who championed charitable and progressive social causes in late 19th century New Orleans. To research my thesis, I lived in New Orleans for one very hot and very humid summer. 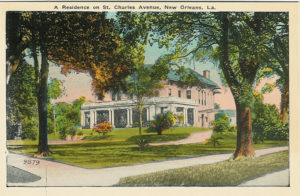 I stayed on the top floor of a rickety Queen Anne house in the lower Garden District and rode the St. Charles Avenue streetcar to Tulane University (or the Public Library or the University of New Orleans) archives every weekday. On the weekends, I walked the narrow streets of the French Quarter, strolled along the riverfront, and haunted the air-conditioned historical museums. My thesis was entitled “Voluntarism in New Orleans, 1878-1905” and focused on citizen efforts to prevent yellow fever outbreaks. After I received my master’s degree, it seemed so natural to write a novel that incorporated everything I had already learned about New Orleans. Specifically, I wanted to write a novel about clever, educated New Orleans women who had fresh ideas about life and who worked in a settlement house. And I wanted to write about smart women who wanted to solve difficult problems like…well, like murder. Because in addition to my love of history, I also loved to read the mysteries of Dorothy L. Sayers (who was one of my favorite smart women). Not to mention that I loved Arthur Conan Doyle’s Victorian detective stories. But before I could start that first novel about New Orleans, I became captivated by the mythology of London’s Jack the Ripper. So I put my New Orleans manuscript in the drawer and tried to write a murder mystery which included (1) A very clever 25-year-old spinster living in (2) Late Victorian London, who (3) Worked and lived at the Toynbee Hall Settlement House in Whitechapel, and is so (4) Fascinated by Jack the Ripper’s gruesome murders of prostitutes that she (5) Decides she must do some detecting on her own. After many false writing starts, I realized that as much as I loved stories set in England, Victorian London just wasn’t “my town”. But Gilded Age New Orleans was. Once I brought my mystery “home” to New Orleans, much of the Fanny Newcomb & the Irish Channel Ripper story fell into place. I still had a lot of research to do: reading issues of the 1889 Daily Picayune newspaper, vacationing in New Orleans as often as possible (hard work, I know; but an author must make sacrifices! ), and—my favorite type of research—touring through Gilded Age buildings that still exist, such as the awe-inspiring St. Alphonsus Catholic Church. 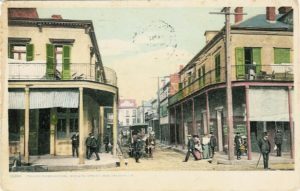 So although I was momentarily seduced by Jack the Ripper and Victorian London, in the end I returned to Gilded Age New Orleans and wrote about a courageous southern woman pursuing a Jack the Ripper copycat. And I got to write about Mardi Gras, streetcars, and the French Quarter. Maybe in Fanny Newcomb’s next Gilded Age adventure, I’ll get to write about hurricanes, beignets, and jazz. This Oldie-but-Goodie blog post was originally published on Jennifer C. Wilson’s Historical Fiction with Spirit!